Ever wondered what happens to the shop props you see in window displays? Well, White Stuff has come up with a novel idea: give them to the public once they're finished with in exchange for a donation to charity. Which is how I found myself adopting a gnome last weekend. Yes, you heard right. 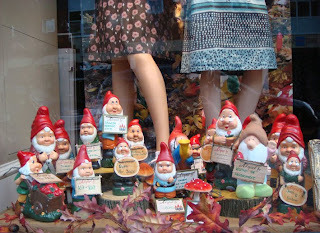 White Stuff's latest window display of garden gnomes will make you smile. Their 'adopted' tags, hanging around their necks like sold signs, will make you intrigued. While the 'Give a gnome a home' poster will tug at your heart strings and make you want to snap up every last gnome that hasn't already been taken. The deal is, for a minimum donation of £5, you get an adoption certificate that allows you to take your gnome home once the window display is removed at the end of the autumn. Now, that's what I call a fab find for a fiver! I've noticed that White Stuff is very proactive in charitable deeds and this one has got to the most fun yet. With the money going to each store's chosen local charity, the company estimates that if every gnome gets adopted, it will raise at least £12,500 for good causes. So, what are you waiting for? Give a gnome a home!